did the commentator say " hodgesen on his nuts" ??? haha. He says on his toes lol..
great tackle, this game was bloody AMAZING!!!!!! p.s scott what ru talking about? 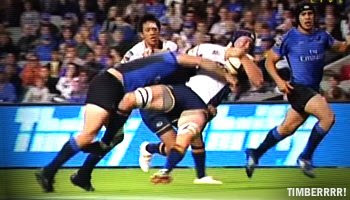 there are heaps of hits in the top 14 on rugby dump!!! !